I wear glasses about 80% of the time and contacts the other 20%. I prefer contacts but like to give my eyes and break and generally only wear them when I'm going out, when I'm active in sports and when watching 3D movies (ever try to get those silly 3D glasses over real glasses - not good). I find that vision benefits are NEVER enough to cover the costs. I understand (and I should, I'm in HR) that employer paid benefits are only meant to ease the burden, not to completely pay for it - but I just feel like vision costs keep going up - and benefits don't change. My benefits provide me with $225 for contacts/glasses every two years and $75 for eye exams every year. This is my vision benefit history since I joined my company. Vision has cost me $692.97 for glasses and contacts in the last two years - less the $225 they cover! Wow! I'll be submitting a receipt for contact lenses for $179 this week - hopefully it get's processed quickly! The cost got me thinking about exploring ClearlyContacts - have any of you used them? The cost for the same lenses would have been $139 if I had used them, makes me feel a bit silly that I looked into it after the fact. That said, it's likely that we'll need a phone of some-sort to book tickets and to be available in case of emergencies - if anyone has any thoughts on that, feel free! 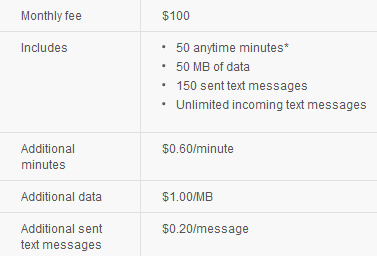 I'm with Bell and Jordan's with Telus - so I figured we might as well compare the two and see which costs less. I'm not 100% sure how much data/voice/text usage that Jordan actually uses - but from a quick glance at my last two bills I'm using about 1000 minutes of voice, 400 MB of data and approximately 2000 text message....so lets just double that to be safe for Jordan's usage - then quarter it because we're going to be in the states for one week. That would mean a need of 500 min, 200MB, and 1,000 text messages - that said, we really shouldn't need or want to be using our phones that much while in Vegas - but we're bound to use some.... I've listed all the options below and would love to know your thoughts. 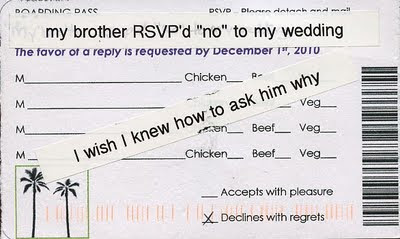 I haven't talked about it much other than when I first got my grandmother's RSVP but am deeply saddened by it. My grandmother RSVP'd no and I haven't made an effort to speak with her since. I don't want this to be the catalyst that keeps me from her - but she's declined a huge opportunity for us to start getting close again. I also don't know how to ask her why - because I don't think she'll tell the truth. Last year I wrote about maxing out my CPP and EI contributions and I was pleasantly surprised when I realized that my Christmas budget was going to get a significant boost at the end of the year. A lot of people in my office start talking about their deductions tapering off around June/July - to which i think those people must make about double what I do! 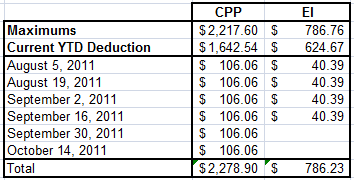 I thought I'd do the math for this again to see when the CPP and EI contributions will stop this year. I got a really great raise back in April so I'm hopeful that it will make a big difference (can you tell i'm writing this before doing the math). In the last pay in September i'll see a $40.39 increase on my pay and then On my October 28th pay I'll see a net increase of $146.45 - hizzah!!! You know what I'm going to go do now? I'm going to go update my monthly budgets! Jordan's mom took me to get my nails done last Monday as part of my birthday present. 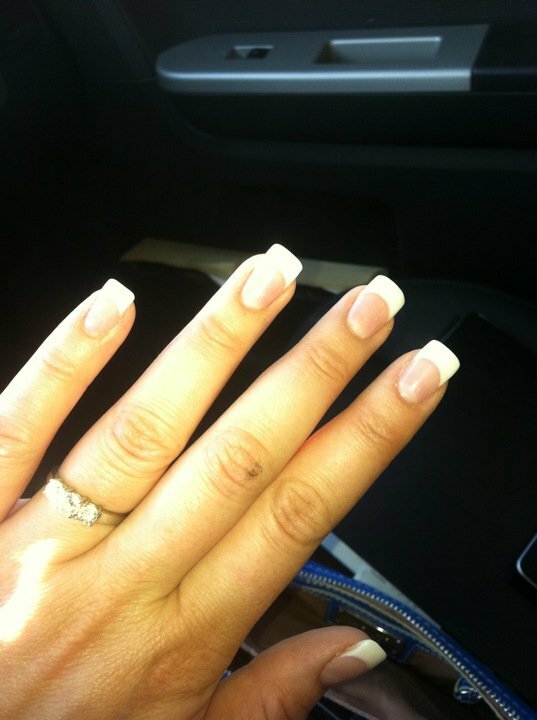 She know that I wanted to get french tips done for the wedding and have never sported anything like it before. They are longer then I think I like - but it's only been four days (when writing this) so I'm still settling into them. Typing is the most difficult thing so far....that and pushing buttons. I have some birthday money that i'm going to use to get them filled in/refreshed - whatever people call it, the week before the wedding - but after that, I'm not sure I want to spend the $40/month to keep them updated. Do you get your nails done? How much do you spend on personal care? Jordan would like to see me spending more on myself - even hair cuts..which I only do once ever six to eight months. My maid of honor recently asked me what my cost per head was for the wedding - and it was strange to admit that I hadn't actually figured that out yet. I promised that I would figure it out and write a post on it. 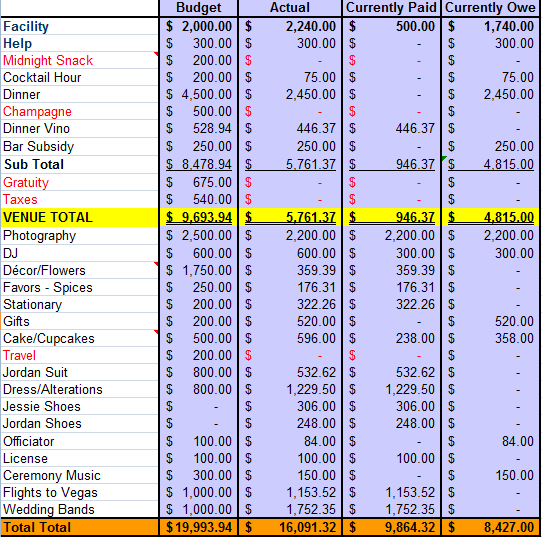 She thought it should include the venue, food, and alcohol costs. 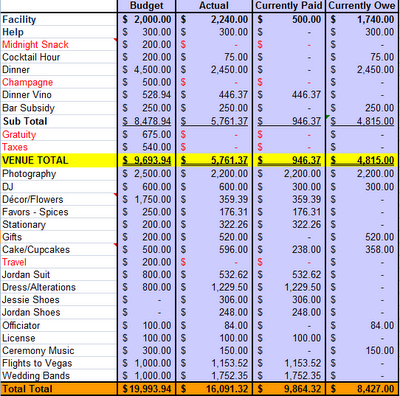 If we then include the other party essentials (photography, DJ, decor, officiator, license, ceremony music) - the cost per head would be $91.18. phew! has anyone asked you married folks out there what your cost per head was? Do they just mean the catering costs or everything else put in? July 21st... just 16 days until the wedding! After the big day, Jordan and I will be spending a week in Vegas for our honeymoon! It'll be so much fun! I'm going to do my best to write some good content for the three weeks around the wedding, but I'm not convinced that i'll be able to make it work everyday. If any of my readers would honor me by writing a guest post (with links to your own blog if you have one) I would be very appreciative! If you are interested, just send me an email with your post to jessiesmoney@gmail.com and i'll schedule it in. Jordan and I are on our second mission to come under $900 in our total variable spnding for a month - as of July 19, 2011 we're in good shape! Just 17 more days to go before the cut off (August 5th, eek! that's one day before the wedding). Wedding expenses not withstanding, i think we just might be able to do it! oh! The annual expense was my AMA membership and the wedding expense was from finally added my engagement ring and wedding band as named perils on our insurance. A few people have asked or made reference to our wedding budget so i thought that today was a good day to post an updated. In the image below you'll see what we expected things to cost, what they actually cost, what we've paid so far and what's left to pay. Anything in red is either no longer applicable or we decided not to do it. Some things, like stationary - were a lot more expensive then i had expected and some things - like grat/taxes wound up being build into our costs - so we saved there. I have cheques ready to pay the rest of the vendors on the day of (that my momma has offered to hold for us) and there are a few items (like the bar mix) that we won't be buying until the week before the wedding. I feel like a post like this is better suited to questions/answers if you have any rather than me going line by line explaining things - so if you have any questions - ask away. I picked these gem's up on Saturday morning at Mappin's Jewelry. I didn't really budget for this...at all...but realized i really wanted some jewelry to wear on the big day. We went to over a dozen stores or so before finding these. The total came to just under $170 including tax - the set is sterling silver with Amethyst stones. ps. i desperately need to update my wedding spending spreadsheet and commit to doing so this week and then posting an update. So things have been crazzy this last little while with the wedding planning. My acoustic guitarist for the ceremony and cocktail hour bailed for a better gig (okay fine, it could be a career maker for the guy but i'm still cranky about it) and we still hadn't confirmed our bartenders as of late last week. I'm very excited to share that we have both of those issues now resolved. Also! My venue operator found us a FLAIR bartender - which is very exciting. He's going to work with a friend of my bridesmaid so that should work out pretty much perfectly. My plan this evening is to go through the last few pages of the 'to do's in The Ultimate Wedding Planner - a book that my maid of honor gave me within days of being engaged. I just want to make sure that we haven't forgotten anything. This book has been extremely helpful so far! Groupon seems to be one of the hottest online couponing services out there right now! If you haven't heard of it yet, Groupon offers unbeatable daily deals from top local businesses in over 100 cities. Each deal goes viral and often sells into the thousands. It's pretty much incredible the discounts that they can offer! Today's offering (which I'm seriously thinking about) is 72% of tanning - which I was thinking of doing before the wedding and our honey moon in Vegas. If you're interested in signing up and buying groupons, please feel free to use this link to sign up: http://www.groupon.com/r/uu21197911. If you do, when you buy your first groupon - I'll get $10 and then you can get people to sign up too!! I can't believe that another month has gone by already! It's July 6th - exactly one month from the wedding...crazy. Anyway, on to the post at hand. 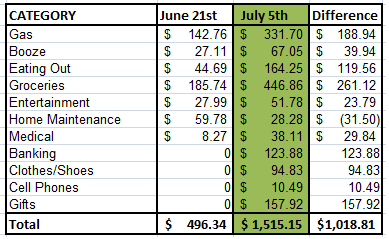 When I did our mid-month check in we had spent just about $500 and we wound up spending another $1,000 from June 21st until July 5th - crazy! 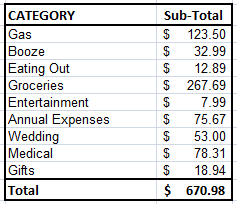 In keeping our eating out (fairly) in check - I think I underestimated how much more we would spend in groceries. Eating out has become such a big part of our lifestyle that it's taking time to adjust. June/July are huge gift months for us as just about every birthday for our families fall then - it's tricky to keep this number down! The home maintenance is just strange - i can't figure out what i thought was home maintenance before, and didn't when i re-ran the numbers...oops. While I wouldn't call June a HUGE success by any means I do feel like Jordan and I are getting better and better about making good spending decisions. Lets cross our fingers for July....can we beat June and spend less than $1,515?